-- Powerset, a company pioneering natural language technology, today announced the launch of its publicly available beta product that reinvents how users search and discover information from Wikipedia™. -- Powerset's breakthrough natural language technology is based on patents licensed from PARC (formerly Xerox PARC) and Powerset's proprietary research. The technology, which can be applied to any topic and any domain, reads and extracts meaning from every sentence in Wikipedia. 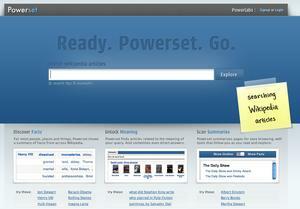 -- This release is the first step in Powerset changing the way users search and consume web content. Unlike traditional search engines, which look for words, Powerset matches the meaning of the user's query to the meaning of sentences. 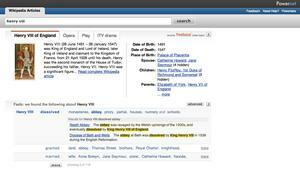 highlighting directly into Wikipedia articles. keywords, phrases, or simple questions. -- "Wikipedia serves a fundamental human need -- a single destination to find a broad range of information," according to Barney Pell, Powerset co-founder and CTO. "This broad content base is a great way for us to showcase Powerset's functionality while giving people a faster time to satisfaction." -- "Our first product has only touched the surface of what our technology will allow," said Lorenzo Thione, co-founder and product architect. "Our team of computational linguists, computer scientists and engineers, together with the PARC technology we licensed, has allowed us to develop a solid platform to begin to change the way people consume content." -- "We have focused on making Powerset able to read and understand documents on the web as part of a broader vision to change the way people interact with technology," said Scott Prevost, general manager and director of product. 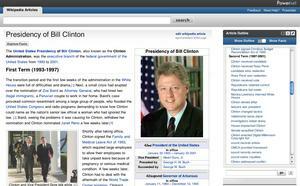 "This first product will make people's search experiences on Wikipedia and Freebase easier, more natural and more relevant." -- "Powerset's new Wikipedia experience is an impressive achievement, and goes beyond what I expected to see from Powerset's first public product," said Carla Thompson, senior analyst with Guidewire Group. "In many ways, it defines a new search category altogether and brings the power of semantics to mass consumers. Once users have experienced the usability and deep relevance of Powerset-enabled Wikipedia search, I imagine they'll start demanding this level of intelligence from all content channels." Please contact Julie Crabill to arrange an interview and/or for additional quotes. About this company Powerset, Inc.